Wound Infection After Colorectal Surgery in the Laparoscopic Era. Background: Colon surgery has inherently been associated with significant wound infection rates from 9% to 15%, the highest surgical site infection (SSI) rate for abdominal surgery. Hypothesis: A laparoscopic approach, with less wound surface area and trauma, would result in a decrease in SSI. Methods: From a prospectively maintained database of laparoscopic colorectal resections, 158 consecutive patients operated over a 12 month period, July 2010 to July 2011, were analyzed. All patients were bowel prepped. Surgery was performed using a clean-dirty technique, by a single surgeon (JM). SSI (superficial or deep), space/organ SSI (intraabdominal/pelvic abscess, peritonitis), death and length of postoperative stay were analyzed overall and based on patient age (> 70 vs. < 70), obesity (BMI > 30 vs. < 30), length of surgery (> 180 min vs. <180 min), preoperative radiation and colon versus rectal surgery. 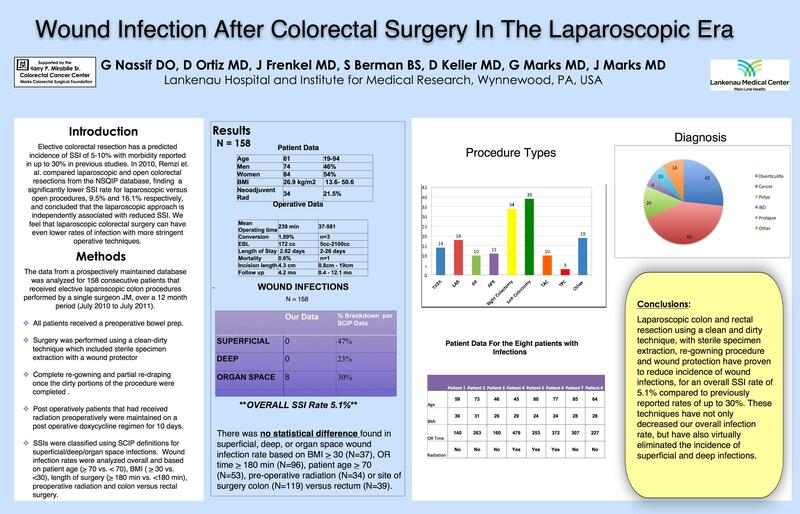 Results: Of 158 laparoscopic colorectal resections, mean patient age was 61 years (19-94) and 54% (N = 84) were female. The mean patient BMI was 26.9 kg/m2. 34 patients (21.5%) received neoadjuvant radiation. The procedures performed were Anterior Resection (10), APR (11), Right Colectomy (34), Left Colectomy (39), Low Anterior Resection (18), Total Abdominal Colectomy (10), TATA (14), Total Proctocolectomy (3) and other (19) for the following diagnoses: diverticulitis (42), cancer (66), IBD (6), prolapse (10), polyp (20), other (14). Overall conversion rate was 1.9% (to open 0.6%, to lap assisted 1.2%). The mean operating time was 239 minutes (37-581) and estimated blood loss averaged 172cc. Patients were discharged post-operatively in a median of 4 days (SD ± 2.62). There was 1 mortality. There were 491 overall abdominal incisions. The average largest incision was 4.3 cm (0.8 – 19). Follow-up was 4.2 months (0.4 – 12.1). There were no superficial or deep wound infections. No abdominal wounds were opened. Deep space infections (abdominal/pelvic) were 8, for an overall SSI rate of 5.1%. There was no difference in superficial wound and deep wound infection rate based on BMI > 30 (N=37), OR time > 180 min (N=96), patient age > 70 (N=53), pre-operative radiation (N=34) or site of surgery colon (N=119) versus rectal (N=39). Deep space infections (abdominal or pelvic infections) showed no statistical distance for any group. Conclusion: Laparoscopic colon and rectal resection using a clean and dirty technique and wound protection dramatically reduces wound infections compared to historic controls. We identified no variables associated with increased wound infections.